Place settings are by far our most common special order pots. 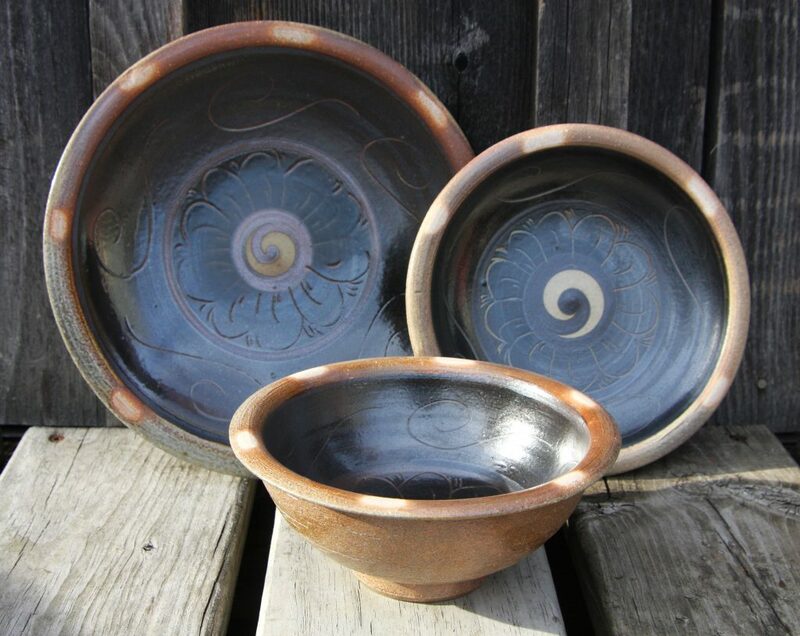 We offer a lovely selection of glazes for you to choose from. 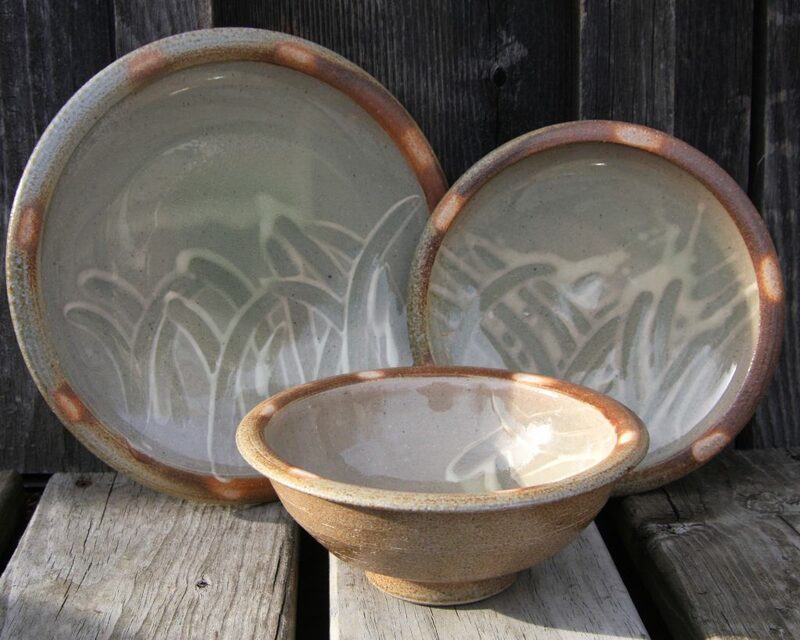 Below are some of our most popular glazes. Our blue glaze is cobalt pigment over a cream glaze. We incise through the pigment to reveal the glaze beneath. The pattern is inspired by ancient Chinese ceramics. We glaze the pots with a red clay slip, wipe the decoration through the slip and then glaze over the top of that with a celadon glaze. We glaze the pots with a white clay slip, wipe the decoration through the slip and then glaze over the top of that with a celadon glaze. 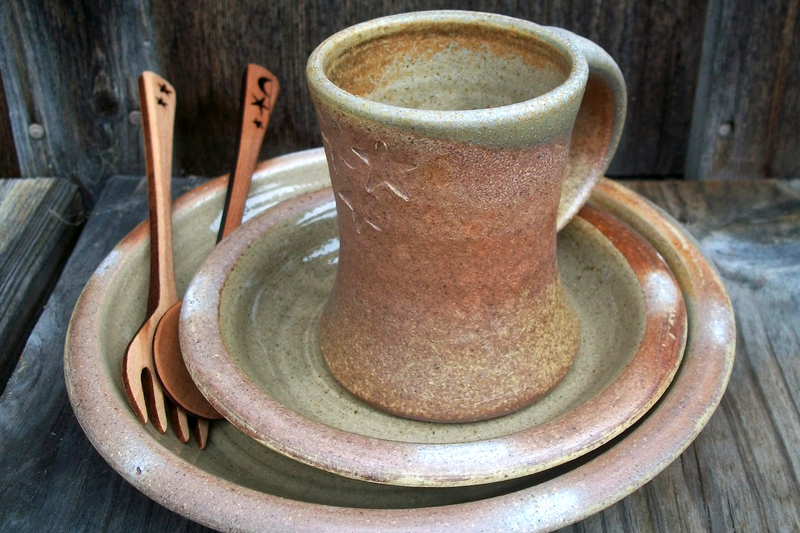 We have many styles of mugs, tumblers, wine cups, and steins that complement our dinner sets. You can customize your place setting by adding a wide variety of complementary dishes such as platters and serving bowls. Use your imagination! The approximate turnaround time for place settings is up to 12 weeks, since we fire about three times a year. The price for one setting is $80, which includes a dinner plate, a side plate, and a soup bowl. Customers usually order six, eight, ten, or twelve settings, and there are considerable discounts for orders of eight or more. We also have a wide variety of mugs and tumblers, as well as serving bowls and platters to accent your settings. Please contact us for more information. We are happy to consider other special orders as well. Please call or email us to see if we would be willing to do what you have in mind. Most of the orders we take are for pots that fit in with the rest of our body of work and allow us to work in our own unique style. Our plates and bowls are perfect for everyday use! They are food-safe, microwave-safe, and dishwasher-safe! Great for eating, serving, and holding your garden’s harvest! Getting married and looking for unique gifts? We do wedding registries! 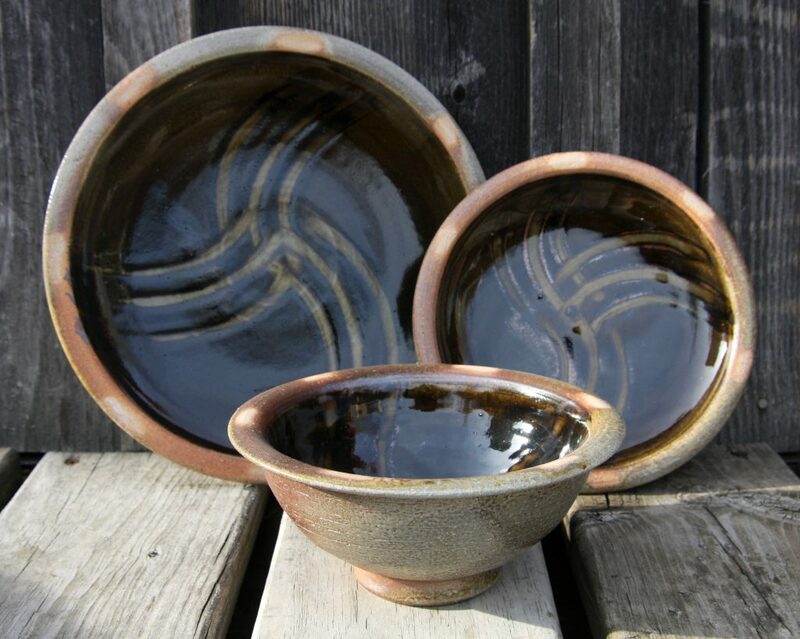 We will work with you to select a group of pots, and then set up a web page with photos of those pots. Send your guests a link, and they can order from us. We offer gift wrapping or shipping. Contact us for more information on your own registry! Ready to place a special order? Contact us today to get started.